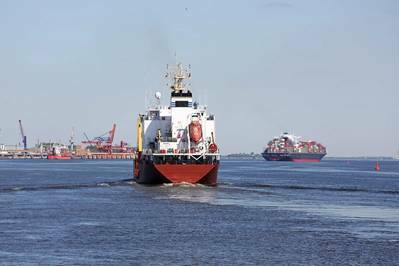 Costs to rise from roughly $100 bln today; just 2 pct of global fleet to have scrubbers in 2020. Global shipping fuel costs are likely to rise by a quarter, or $24 billion, in 2020 when new rules limiting sulphur kick in, consultants Wood Mackenzie said on Wednesday. The ballooning costs will come as the change in regulations forces a portion of the world's fleet to switch to lower sulphur, but higher cost, fuels such as marine gasoil (MGO) and ultra low sulphur fuel oil. The International Maritime Organization's (IMO) rules targeting air pollution will cut the maximum amount of sulphur emissions that ships worldwide can burn to 0.5 percent of fuel content by 2020, from 3.5 percent currently. Ships that install "scrubbers" can continue to burn cheaper high sulphur fuel oil, but the bulk will not install these in time for the shift in 2020. "Switching to MGO is a more costly solution, and in full compliance, would probably see freight rates increase, perhaps by around $1 a barrel," said Wood Mackenzie senior research analyst Iain Mowat. Wood Mackenzie said its "base case" for cost increases is $24 billion in 2020, compared with a total global shipping fuel bill of roughly $100 billion today. However, if no vessels added scrubbers and all ships complied with the rules, the spike could be as high as $60 billion. The rule change marks a seismic shift for the shipping and refining sectors. The IMO is meeting in London this week to hash out further details on how it will implement the rules and ensure compliance. Mowat said that while shippers could expect a 20-50 percent return on investment cost for installing scrubbers, the penetration rate for them would be limited by factors including limited access to finance, scrubber manufacturing capacity and dry-dock space. Wood Mackenzie estimates just 2 percent of the global fleet will have scrubbers by 2020. As a result, Wood Mackenzie said the world's refiners need to gear up to churn out the lower sulphur fuels that vessels will need, and even the primary spots for refuelling ships could shift based on where lower sulphur fuels are available. "Singapore, for example, could potentially lose some of its market share for bunker fuels to China as shippers look for alternative locations with a surplus of compliant fuels," Mowat said. "China, with ample MGO supply, is well positioned to attract shippers."